You must make reservations at least 5 minutes in advance of the time at The Daily Kitchen and Bar - Short Pump. We strive to serve foods that are not only delicious, but also health conscious, environmentally friendly and socially responsible. We use organic, all natural, local and sustainable ingredients as much as possible while still keeping our prices fair. In addition, we also offer an extensive selection of vegetarian, vegan, gluten free and paleo options. We sat outside on a beautiful day and thoroughly enjoyed ourselves. The server was quick and attentive. We did have a little problem with the kitchen putting salad dressing on a salad when we had ordered gluten free dressing. We know in the future to order no dressing to avoid dietary problems. However, the overall experience was enjoyable. Scallop dish with bacon/brussels sprouts was fantastic. The noodle dish was not as good a value. Fabulous evening here! The food was wonderful. Ambience was wonderful. The server was wonderful. Didn’t rush us. We sat and enjoyed dinner and conversation for almost 4 hours. I highly recommend! Fresh ingredients are used extensively throughout the menu. Have visite the Short Pump location several times, consistently good food served. We were having lunch with a friend. Food was excellent, as always, and our server was polite, knowledgeable and friendly. We always enjoy dining at this Short Pump location. Delicious food and great service! The best grilled asparagus I’ve ever had. Plenty of healthy and yummy choices on the menu! The restaurant was nice and bright. Nothing anyone at the table got to eat was very good. The one in Carytown is so much better. Disappointed that it didn't stack up. Our daughter is a vegan. We asked her to choose a restaurant for the four of us that evening. Thus, she chose The Daily. Plus, she had given us a gift card a couple of years ago, so we used that. We had a reservation and were happy that we were placed away from the crowd and near the windows. Three of us were happy with our dinner selections, but one said his hamburger was too dry. One of my favorite restaurants in the Richmond area—everything I’ve eaten there was great! Only drawback is that it’s a little noisy in there, but service and food are fantastic! Regardless of what you order or when you come, The Daily is fantastic. The cocktails are fairly priced and delicious, the spinach and artichoke dip is probably the best I've had, the brussel sprouts are delicious, and the seared salmon with the chimichurri has the right amount of kick and is cooked perfectly. The happy hour menu is top notch, as well. I would recommend this place to anybody! The food was very good and our server was excellent. Great staff, food, ambiance, and value for brunch! Wonderful experience! Not enough parking. Great food, lots of choices and friendly/helpful service. My party loved the Stir Fry Bowl w/ shrimp, Crab cakes, and Thai Noodles w/chicken entrees!!! The food was delicious. Our waitress was professional, helpful and right there when we needed something. We had a group of 6 and everyone enjoyed their food. We would definitely all recommend the crispy brussel sprouts. Great place for group meal. Nice menu selection and wine/beer list. Will go back! Crisp, clean and perfect. We came for brunch and the entire experience did not disappoint. 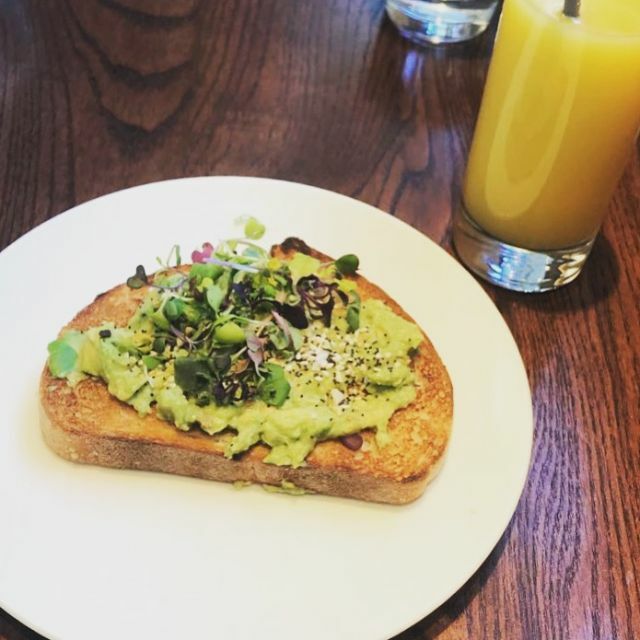 The avocado toast was hearty and delicious. The potatoes were delicious and cooked to perfection. The wheat toast was chewy and had a hint of sweetness to it. My daughter couldn’t say enough about her cheesy grits. Service was impeccable as well. While my meal was good the service was erratic - our appetizers were forgotten and then delivered after the entrees and then the lettuce for my wife’s salad had flies all over it from not being properly washed. We politely let our waitress know at the end and were barely acknowledged. Wonderful dinner all the way around! First visit but will definitely go again! I love everything about The Daily, from the food to the service to the atmosphere. Everything is great! Keep up the amazing work! The only issue is the noise. The restaurant is beautiful but there is nothing in the design to absorb sound. Great food and great wait staff. We've been here many times because of the varied menu which is good for us and my vegan son. Our last visit wasn't good. They were moderately busy but not overly so. We were seated right away but not greeted my the waitress for over 15 min. At 35 min in, we still didn't have our drinks and my husband walked up to the bar to pick them up since the waitress hadn't brought them over. Salads that were to come out first came with the meal. We hurried to order refills,etc when the waitress came because we weren't sure when she'd be back. Food was good. This was the 2nd slow experience withing 10 days- last time was when my son and husband met for lunch. It will be a while before we give this one another try. The service was excellent. Our waitress was extremely kind, and offered to take some pictures for us. Had a wonderful experience. Would highly recommend and come again. Some of the charm of the Cary Street location is lost since the Short Pump location is not on Cary Street! Food was ok but nothing spectacular. Not sure I would go back. The restaurant was beautiful and had plenty of vegan options. It was the perfect place to satisfy many different diet needs. Server was average. Very noisy. Good food. Quick service and wonderful ambiance. Loved the drinks! Fantastic. This restaurant could easily become one of our favorites. The staff were so accommodating, especially to families with children; yet the atmosphere was relaxed and inviting. Best of all was our waiter, Scott, who deserves six out of five stars! Great server but food took a while to come out to us. The food was delicious. Service was AMAZING and always is. This is the main reason I continue to go The Daily. It's still just too loud and hard to have a conversation sometimes. My oysters were overly salty (breading), but the chickpea salad was delicious. Great food. They accommodated us when we arrived early with an extra person. What a wonderful experience. Bleu was our server and she couldn't have done better. She had answers for every question, and her suggestions were great. Thank you for a wonderful brunch. We will definitely be back. We will ask for Bleu. I love the Daily Kitchen- the atmosphere and employees are great. I ordered the kale salad with chicken. The salad was terribly underdressed and underseasoned. Otherwise the experience was pretty good.